1. 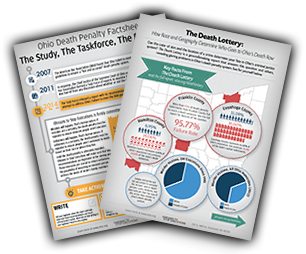 Thank Ohio Senators Bill Seitz (R-8) and Sandra Williams (D-21) for committing to pass death penalty reform legislation! Send a message to Senators Seitz and Williams! Choose your stance below to take action now! I am firmly against the death penalty, but if we must continue to execute, Ohio’s system needs to be as fair and accurate as possible until we repeal altogether. Even though I believe in the death penalty in principle, I want our criminal justice system to be as fair and accurate as possible. Download this front-and-back flier and make copies to share with friends, family and neighbors. Post them at the library, book stores, coffee shops, and leave one in magazines at the doctors office, salon, and the car repair waiting room. You get the idea – help put the information into people’s hands. Not sure who your state senator or representative is? Use this tool to check! Click here to become a member and receive our electronic alerts, including our monthly e-newsletter.